Just got back from Krabi. It was raining cats and dogs since yesterday afternoon in Krabi so it didn't feel so bad leaving the place. But.. 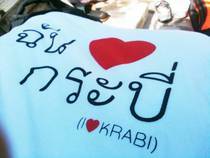 I LOVE KRABI! I LOVE THAILAND!